of course, there is a significant amount of the bright apple green that my camera hates. overall, the sweater is BRIGHT! fun! adventurous! i’ll try to come by a photo of him in it. artyarns supermerino – a gift from my mother-in-law that was going to be some knee highs, but it waited in the stash too long and voila! the irony of the superwash in this sweater? the mama cloth dipers with wool soakers, likes wool, would know how to wash wool and love to have regular wool. 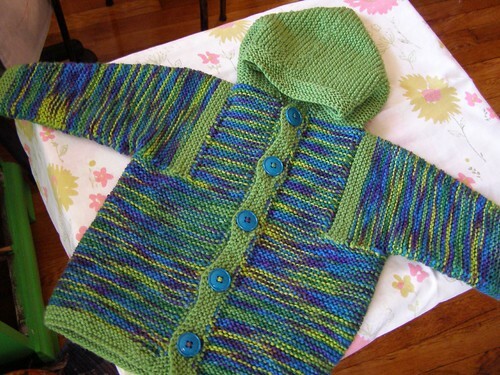 but it was the yarn that worked and it was in the stash. 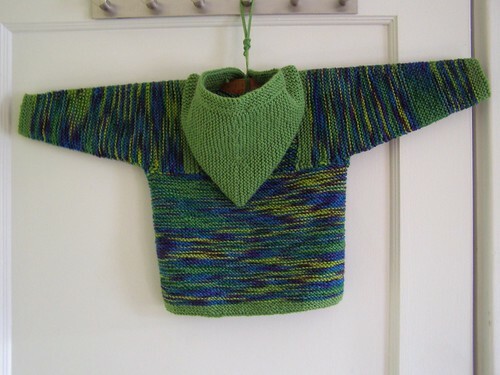 this was my first tomten and a very fun knit. i like EZ because i can read her short pithy directions and mostly memorize the section i’m working on. i still prefer the bsj :) of course, but i must say i’m dying to see that little hood on the little head!! I’m with you. 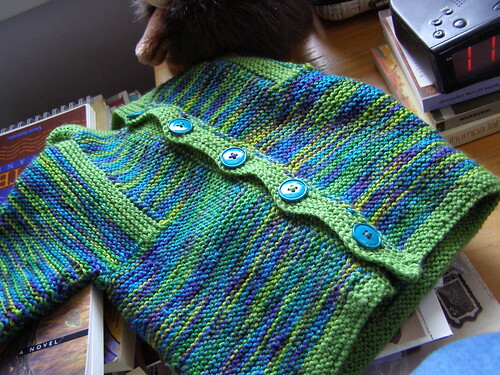 About hip deep in baby knits. Love the tomten jacket. Great job! Luv it! I like bright colors too. That jacket is on my long list of things to do. I always wonder how many hours are invested in each project? Gorgeous. I definitely see a tomten in my future. But maybe an adult one! I agree, that hood is perfect!